What client provider am I using to connect to SQL Server? In my previous post, I discussed the following error, and how to resolve it. In this post, I’m going to answer some common questions about the provider you are using to connect to SQL Server, and which updates you should apply on the client side. For example, what driver are you using when you connect with SQL Server Managerment Studio (SSMS), or Reporting Services? System.Data.dll version 2 is packaged with .NET Framework 3.5 and below, and version 4 is packaged with .NET Framework 4.x. Find the version of your SSMS, and as long as you upgrade your current .NET Framework for your system, you should now be able to connect to SQL Server on the client side. You will still need the appropriate updates to SQL Server to support TLS 1.2. If you are wondering what Reporting Services uses, it’s also a .NET application. The difference however is that Reporting Services 2014 and below is built off of .NET Framework 3.5, and hence uses ADO.NET 2.0. What if you have a 3rd party application, and you really don’t know what you are using to connect to SQL Server? I would probably ask the application vendor. However, if you are unsure, you might be able to do some investigation on your own. For example, if your application is a .NET application, chances are that you are using the .NET drivers. You’ll want to check your application logs to see what drivers/providers it’s calling when it’s failing to connect. 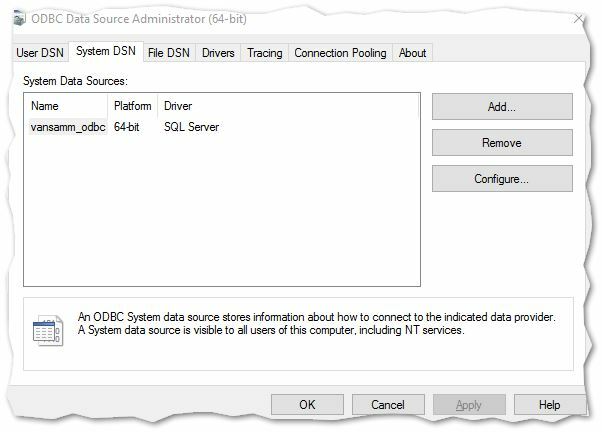 The System DSN will give you the driver that is being used, and the Drivers tab will show you what drivers are installed. The driver called “SQL Server” or SQLSRV32.DLL is the driver that is installed with Windows, and is deprecated. There’s no updates to this driver that will support TLS 1.2. 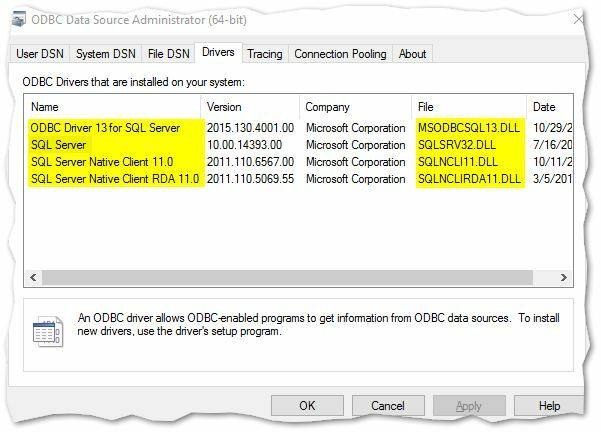 SQL Native Client (SNAC) 11.0 is installed with SQL Server 2012/2014, and SNAC 10.0 is installed with SQL Server 2008/2008 R2. These are the SQLNCLI11.DLL and SQLNCLI10.DLL assemblies, and depending on what your application is calling, you’ll want to update these drivers to support TLS 1.2. Hopefully, that clears up some confusion and gets you on your way to be PCI Compliant.